Just when you thought awards season was over, along comes another awards ceremony, albeit a bit more mainstream, to entertain the masses and get celebrities walking the red carpet in all their finery. 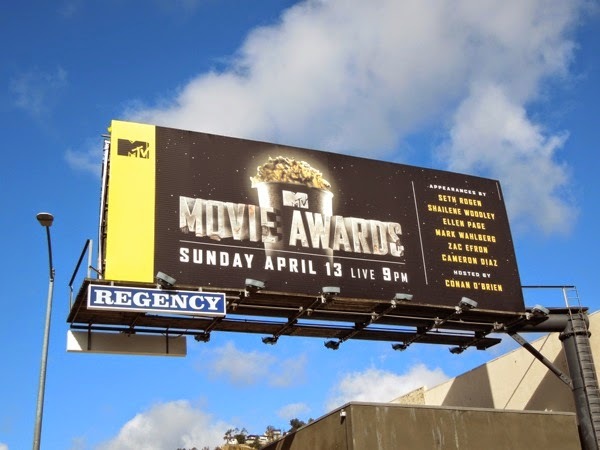 Yes, it's time for the MTV Movie Awards again, the channel famous for movies, no wait music videos, umm, does it really matter anymore. 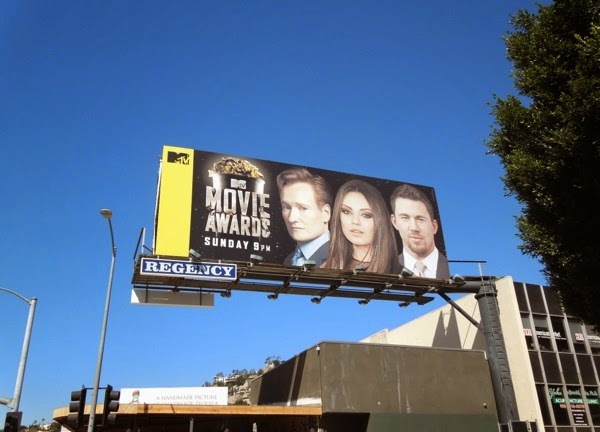 Since their inception in 1992 the MTV Movie Awards have gone from being pre-recorded to being broadcast live (from 2007 onwards) and this year comedian and talk show host Conan O'Brien has the honour of presiding over festivities, with guests such as Zac Efron, Seth Rogen, Ellen Page, Shailene Woodley and more famous names besides slated to appear. 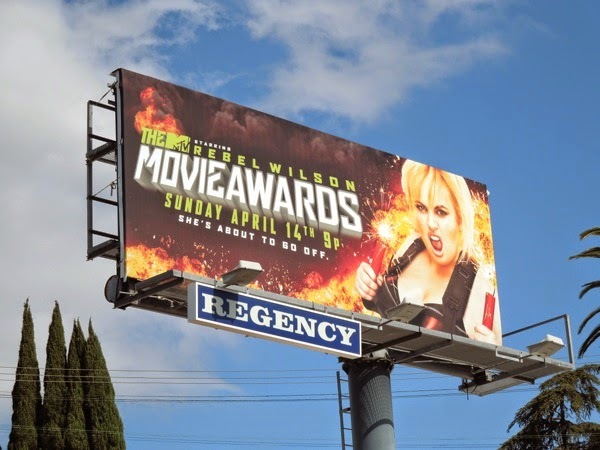 Meanwhile last year Rebel Wilson hosted the awards show in her own inimitable style, and even received her own explosive billboard spied along the Sunset Strip on April 8, 2013, whilst Zac Efron, Emma Watson and Will Ferrell shared another billboard further east along Sunset Boulevard for the live spectacular. 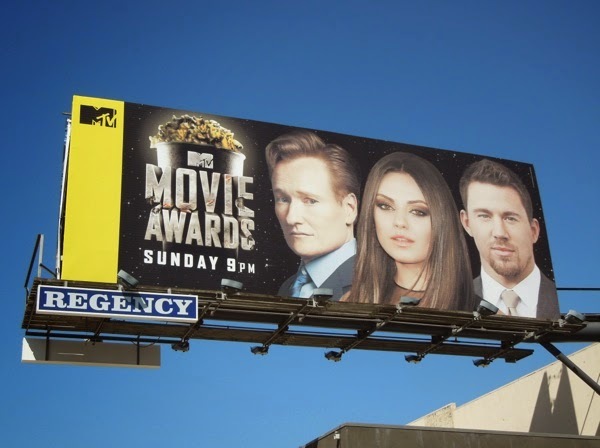 This year's MTV Movie Awards teaser billboard was spotted on April 1, whilst the version featuring Conan O'Brien and hotties Mila Kunis and Channing Tatum was snapped a week later on April 7, 2014. 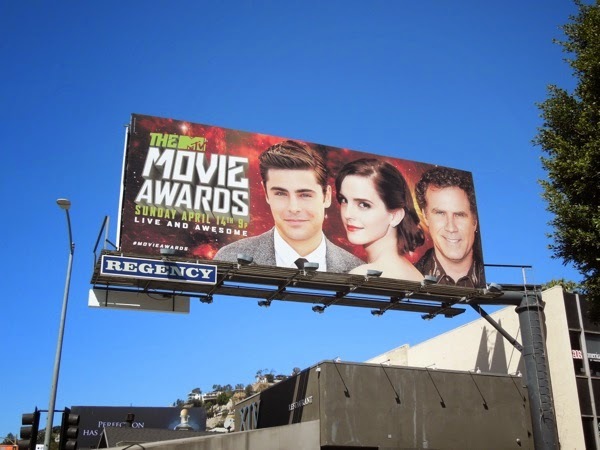 For more cool awards billboards and to compare how they promote their prestigious events, be sure to check out these Golden Globe Awards billboards, Academy Awards billboards and The Grammy Awards ad campaigns.